The 2014 Mardi Gras Ball – Saints and Sinners! 2013 Mardi Gras Ball : Such a Night! Doors & Music start at 6:30pm – 11pm. Light food available for purchase – full bar! Each year the Krewe waits until January 6 – also known as Twelfth Night, the traditional start of the Carnival season in Louisiana – to announce the year’s theme. This year it will be “Tableaux on Pirates Alley”. The theme combines history of Court Tableau of traditional Louisiana Krewes, with the historic alleyway behind St. Louis Cathedral in the French Quarter in New Orleans. Tableau are a grouping of costumed individuals posed to depict a particular scene, such as parts of popular mythology, historical event, or famous painting. Traditional Louisiana Krewes stage tableau of their royalty and court to show their fabulous costumes and headdresses to the crowd of attendees at their annual formal Mardi Gras balls. Pirates Alley today is an endlessly photographed pedestrian only street bordered by cast iron fencing, with cobblestone roadway, cafes, artists and entertainers. The street is home to the old Spanish Calabozo Prison where the notorious pirate Jean LaFitte and his brother Pierre were jailed in the early 1800’s. 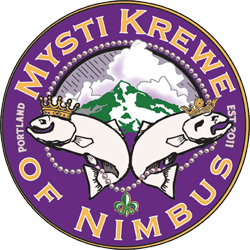 Portlanders are also invited to join the Mysti Krewe of Nimbus on Fat Tuesday Evening – March 5th, 2019 – for the annual free, family-friendly Mardi Gras Day Parade down Mississippi Avenue. 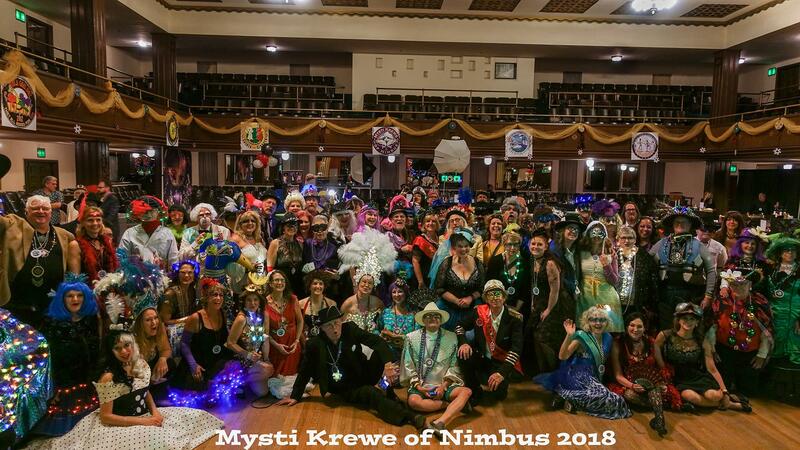 2019 Mardi Gras Ball and Fat Tuesday Parade Dates!